Predict the potential drug-drug interactions of your test compound or xenobiotic using our Cytochrome P450 (CYP) Inhibition assay. 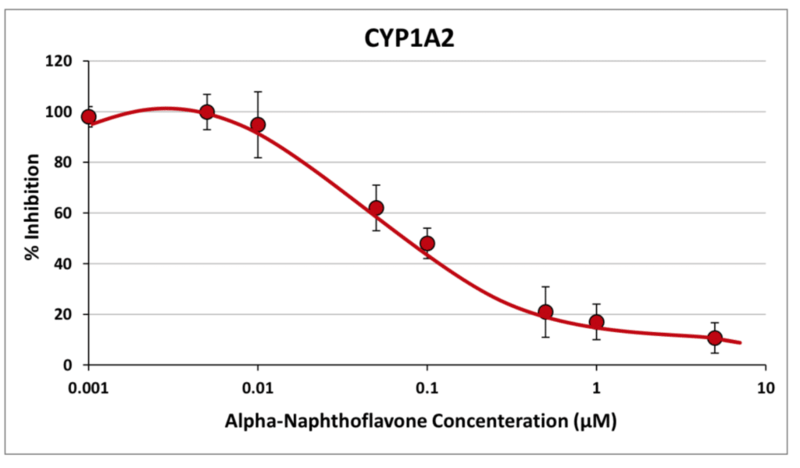 The graphs illustrate the inhibition of CYP1A isoforms using a strong inhibitor (alpha-naphthoflavone) in human hepatocyte microsomes. Alpha-naphthoflavone is a strong inhibitor with an IC50 of ~0.1 μM. IONTOX’s CYP inhibition study can be combined with our Human Dynamic Multiple Organ Plate to assess the effects of the tested compound or metabolites on subsequent tissues, such as the liver, kidney or lung. 1. FDA (2012) Draft Guidance for Industry: Drug Interaction Studies - Study Design, Data Analysis, Implications for Dosing, and Labeling Recommendations.